By now many people are familiar with the idea of geoengineering, or the deliberate attempt by humans to manipulate the Earth’s climate. Although the idea is controversial, many scientists argue that geoengineering may be required in order to avert global warming and maintain the Earth’s habitability in the future. One potential geoengineering idea is to inject aerosols into the upper atmosphere to reflect a small percentage of incoming solar radiation back into space. This would in turn reduce the amount of solar radiation headed towards Earth’s surface, thus reducing global temperatures. However, new research from Carnegie and the California Institute of Technology suggests that injecting aerosols into the atmosphere would in fact whiten our skies. Rather than the dark bluish hue we’re often used to seeing, the skies would be much lighter – turning to an almost white in the daytime. 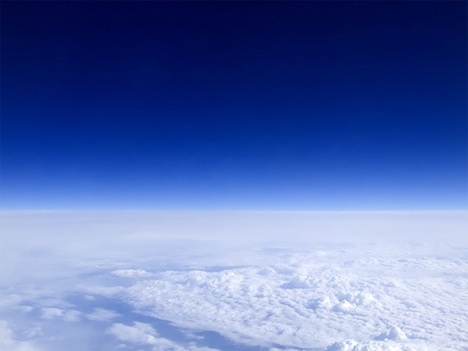 To come to their conclusions, researchers Ben Kravitz, Ken Caldeira, and Douglas MacMartin studied the impacts of sulphate-based aerosols on sky color and brightness. They found that particle size could have a direct impact on the color of the sky, and could even cause sunsets to have an afterglow at night. This is because when the level of atmospheric aerosols increases, the amount of direct sunlight reaching the ground is reduced but the amount of softer, diffuse sunlight is increased. However, Kravitz et al. also highlight a few other implications of increased atmospheric aerosols. For instance, solar panels would be slightly less effective because they would be receiving less sunlight. On the positive side of things, plants would grow much more efficiently because they thrive under diffuse light conditions. But perhaps what Kravitz et al.’s research highlights most of all is that we must be very careful about what we do to our planet. We are already sending the planet hurtling towards irreversible global warming as a result of our actions over the past 100 years. We do not want to commit other irreversible mistakes through geoengineering that may be even more damaging to the habitability of the planet. It does pose a series of interesting questions. Do we devote time and energy into geoengineering solutions now in preparation for runaway global warming? Or do we devote time and energy into reducing carbon emissions and preventing global warming in the first place? Do we do both?